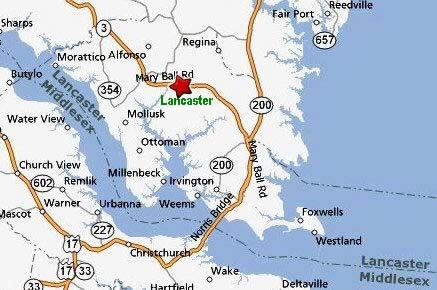 Lancaster County is a county located on the Northern Neck in the Commonwealth of Virginia, a state in the United States. As of 2000, the population was 11,567. Its county seat is Lancaster. It is located near the mouth of the Rappahannock River. Lancaster County was established in 1651 from Northumberland and York counties. Historic attractions open to the public include the Mary Ball Washington Museum and Library, Belle Isle State Park and the eighteenth-century Christ Church . Lancaster County Clerk of the Circuit Court has Marriage Records from 1701 , Land Records from 1652 , Probate Records from 1651 and Court Records from 1652 and is located at the County Courthouse on P. O. Box 99, Lancaster, VA 22503; 804/462-5611, Fax: 804/462-9978 . There are a few online databases for Court, Land and Probate Records which include: Virginia Land, Marriage, and Probate Records, 1639-1850, Virginia County Records, Volume VI, Volume VII and Volume IX. LANCASTER LIBRARY - Address: 235 School Street, Kilmarnock, VA 22482-0850, United States; County: Lancaster; Phone:804-435-1729; Lancaster Library is a Public library. 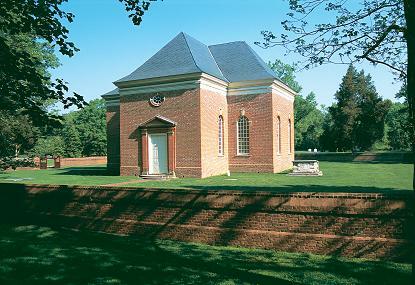 This library is the central facility associated with the the library system that serves Lancaster County, VA. The collection of the library contains 33010 volumes. The library circulates 103787 items per year. The library serves a population of 11500 residents. as having been either born, married or died in this location. To find out more about each surname listed above click on the corresponding LINK. 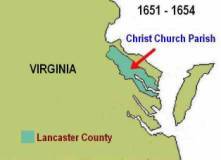 Created in 1651 out of Northumberland and York counties, Lancaster County originally included lands on both the north and south sides of the Rappahannock River. From 1651-1654, it is likely that the whole county formed one parish. 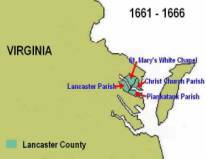 In 1654, an order of the county court divided Lancaster County into two parishes, the Upper Parish and the Lower Parish. 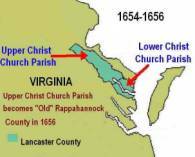 In December of 1656, the Assembly used the boundaries of this Upper Parish to create the new county of Rappahannock, which, like Lancaster, included lands on both the north and south sides of the river. 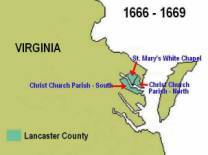 In April of 1657, the Lancaster County court again divided the county into two parishes, this time creating one parish on the north side and one on the south side of the Rappahannock River. By 1661, each of these parishes had divided, so there were now two parishes on the north side and two parishes on the south side of the river. The upper parish on the north side eventually became known as St. Mary’s White Chapel. The lower parish took the name Christ Church Parish. On the south side of the river, the upper parish became known as Lancaster Parish, while the lower was called Piankatank Parish. 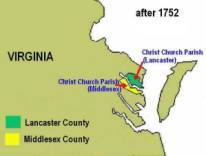 In 1666, Lancaster and Piankatank parishes reunited as one parish called Christ Church Parish. 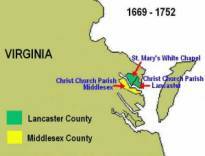 When in 1669 Middlesex County formed from that part of Lancaster County on the south side of the Rappahannock, this parish was now referred to as Christ Church Parish, Middlesex County. 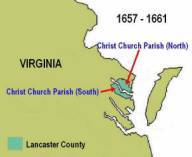 This left Lancaster County, now only encompassing lands on the north side of the Rappahannock, with two parishes—Christ Church and St. Mary's White Chapel. Though Christ Church and St. Mary’s White Chapel shared the same minister and a glebe, they considered themselves separate parishes. Each had its own vestry and churchwardens, but they met as a general vestry to consider issues related to both parishes, such as the minister, the glebe, and the glebe house. In 1752, residents of Lancaster County petitioned the Assembly to unite as one parish. Though it came to its conclusion through an erroneous reading of the records, the Assembly decided that no act of the legislature or order from the county court had ever created St. Mary’s White Chapel or legally divided Christ Church Parish and thus the whole of Lancaster County was included in one parish--Christ Church Parish. A general vestry held on November 17, 1752 accepted the Assembly’s report and formally united the two parishes as Christ Church Parish. St. Mary’s became the upper precinct of the parish, and Christ Church served as the lower precinct. Although Christ Church and St. Mary’s White Chapel were now united as Christ Church Parish, the 12 vestrymen of each church (or precinct) continued to meet independently, giving the parish a total of 24 vestrymen. In February of 1759, residents from both the upper and lower precincts petitioned the Assembly over this arrangement, arguing that the vestry of “each Precinct of the said Parish, though but one, has hitherto acted separate from the other...which frequently occasions Disputes and Controversies.” Moreover, some of the vestrymen had dissented from the Church of England. The Assembly subsequently dissolved the vestry because it had 24 members, called for a new election of 12 vestrymen for the whole parish, and forbade dissenters from serving on vestries throughout the colony. From this point forward, Christ Church Parish had one vestry, and it governed the affairs of both churches. The list below will assist in your research regarding the matching of your ancestors birth, marriage, death dates and in what locality of this county these events may have occurred. The red star in the map at the left designates the location of the seat of government for this county. external links to obtain additional knowledge about this topic. Lancaster County, VA Genealogical Records Info. During our research we have collected images and photographs that are of general interest to a variety of localities. Some of them are presented on this website because we believe they tend to provide the reader with additional information which may aid in the understanding of our ancestors past lives. location we would greatly appreciate hearing from you. Use the following LINK to ascertain whether we have any images that pertain to this location.